Al shabaab creating a new state: Are we seeing the annexure of the north eastern regions of Kenya? Would you now send your children to school anywhere in that region? Even the ministry of education has relocated all students and staff from Garissa University. What of businesses now closing down as part of the population moves away? If you were a tourist or investor what are the chances you would want to go there? I am sure even nonresident Kenyans won’t dare that. Don’t ignore the fact that the terrorists are getting bolder with the success of each attack in time we may be staring at chaos all over the country as was the case in Nigeria with attacks moving from the north into Abuja and Lagos. Some similarities notable in the genesis of Boko Haram which came into being around 2006 led by a radical Muslim cleric Muhammad Yusuf in the north of Nigeria. The sect focused its pronouncements against apparent marginalization, poor education levels and joblessness among the youth. One editorial account says, - “Late Yusuf also took advantage of the irresponsible leadership at all levels of government as unemployment, poverty and insecurity become the order of the day. And, as he pointed out such failures, citing verses of the Qur’an and the sayings of the Prophet, the youth saw him as the leader that will indeed deliver them from malevolence to the promised land”. This quick internet check on that history shows uncanny similarities including suspicion and outright dislike for government officers, the misreading and consequent mishandling by security agencies of a growing dangerous situation in a particular region of Nigeria and of course the ever present corruption at all levels of government. Sounds familiar? May be a bit too familiar, uncomfortably so! Al shabaab may not at this moment have shown any desire to capture real estate but that also may have been said for Boko Haram in 2006. Furthermore the trend internationally set by ISIS of late, indicates a move towards acquisition of territory in which to establish a caliphate. After Kenya’s forceful takeover of al shabaab’s territory in Somalia and consequent control of it by AMISOM the group remains stranded between Kenya and regions close to our border in Somalia. They had the idea well before ISIS and we took that away from them. They now need a safe heaven and possibly new territory to govern. I started by asking a series of questions my general answer to them all is that, whether Al Shabaab knows it now or not the annexure of Kenyan territory is what they are about at the moment. First through psychological compulsion by threat of violence or enticement (Promised Land), later maturing into physical control of land after non locals including government employees have been expelled and locals are thus strategically overwhelmed and assimilated into an ethnic and religiously based nation. Travel advisories: Are they all coincidental? Gen. Nkaissery said the last one was based on issues other than security, is that still the position now? If memory serves me right there were advisories against travel to Kenya or updates of them just before the Mpeketoni attack, before the Mandera attacks and before Westage also. Either way we evidently have to deal with our national security issues the terrorist seem now to strike almost at will compared to Europe where no advisories have been given and major attacks seem to have been made almost impossible. Posturing and tough talk with little improvement in the situation is embarrassing you, stop it. Let’s begin with actually crafting a national security strategy that will guide our self protection and inspire confidence in our development partners. If effected properly that alone would remove need for anyone giving precautionary advise against our sand and sunny beaches. Only four attackers: the small team was able to kill 147 victims in the campus. That would have been harder to achieve with armed trained security guards, this adversary has evolved not so for security companies hence they will probably lose more of their staff in this way if no radical changes are made to their operations.http://winnermanconsult.blogspot.com/2014/06/armed-private-security-considerations.html Even where there is police back up probably like at Garissa University that is mostly composed of only two armed officers. In this instance if they were present they were ineffective against the 4-6 armed attackers. Why that was is open to speculation but in a good post incident review the reasons may range from issues like deployment of inadequate number of officers for the size of facility to be guarded or exhaustion from long hours of work, indeed all caused by lack of adequate manpower at the police station. This can be remedied in a manner that does not include outright disregard for due process of law examples of this mentioned in articles highlighted above. The incident review must also establish if the said officers deployed to guard the university on that fateful day were adequately armed? For example, did they run out of bullets after the first magazine worth twenty or so rounds? Were they trained well enough to counter this sort of situation? Were they properly briefed for such an eventuality given the heightened threat status against universities? Were they specifically deployed against the terrorism threat to the campus or were they on a different assignment like protecting a cash office or required to patrol adjacent estates for general security provision instead of solely protecting the campus? Moral issues are critical to coming out on top of any live combat situation and thus this must be investigated to see if a regular officer given their current terms, conditions and organizational culture will be willing to put his life on the line where the criminal has evidently greater force. I think not but maybe that’s my bias. Immediate Decisive Intervention: The fact no time was wasted once the incident occurred has spared us all greater horror. Our special forces seem to have gotten their act together since Westgate, although they may have taken loner to get to Garissa. If we can’t pre-position these teams in each sub county then make prior arrangements to ensure they can be brought into any action scene anywhere in the country, not more than one hour from a request being made. Pre-positioning is ideal the teams could be charged with mastering designs of every vital installation (university campuses included) and access way within their jurisdictions. They would also contribute to the alignment of all emergency response procedures for their regions thus a faster more effective counter action could be achieved. Anyway, the ideal security service should not allow us to get to the point where we need Special Forces interventions in the first place. Regular police officers need increased skills in detecting, preventing and countering this comparatively new threat in the country. As a significant part of Kenya’s frontline security they seem to be in the dark almost like sending your 5yr old child to slaughter the family bull and roast it for your visitors. If nothing is done to retrain the beat man and improve the factors required for his optimal output we will surely be courting repeated disasters, Garissa university style. That said we must commend the officers who noted the al shabaab anthem being played as a ring tone on a cell phone from one of the guard’s at the university who survived the attack. He was arrested and further investigation is unearthing details that seem to link him to the group probably as one of the inside men. I may be mistaken but if he is the one shot in the thigh it may be something to see if there are burn marks or other indications of the gun being fired close to the leg. Forensic examination may also be able to determine what weapon was used to shoot him a handgun calculated not to cause him maximum injury by breaking the leg bone or the standard weapon of use in the attack say AK47s, was the hand gun used against other victims like his two colleagues at the gate also or was it used in that one instance? Especially if it was used in the initial shootings to gain entry might there be a chance that the surviving guard now suspect shot and killed his coworkers and then open the shut gate? Residue on his hands and probably finger prints at least on the remaining rounds of the gun used may reveal that. Away from investigations the alertness and awareness on the part of police officers who detected his suspicious-ness is what we require more of from the police service only this time it has come after the fact! 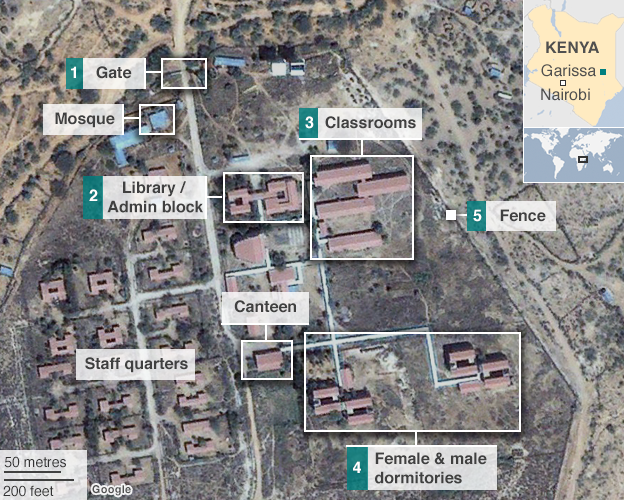 Operationalizing the intelligence is still a challenge: With only the little public information I can’t understand why intelligence analysts didn’t connect the dots apparently pointing at an imminent attack on Garissa University. First despite presidential denials of the threat it is plain that universities had been warned of this possibility and many of them including USIU, Kenyatta and Nairobi universities had put out internal notices to that effect. Garissa University happens to be the only one in the entire north eastern region of the country and Garissa county has the notorious reputation of being the favorite target for most terrorist attacks in the country at around 33% of all attacks compared to Nairobi’s 22% while the coast region has much less than that. These three facts alone point straight at an attack on the university at Garissa even if there was doubt that should have been outweighed by the non essential travel advisories of Britain and Australia that highlighted that region as a likely target. Assume intelligence wasn’t against universities only, say it included hotels and other soft targets, as vigilance is heightened nationally special focus should have been on this attack prone region more so with the capabilities from the KDF camp at Garissa available to assist the police there. So who dropped the ball if intelligence was available was it the analysts who didn’t quite identify it or was it the police operations running around the country fire fighting in Mandera, Kapedo, errant MPs etc. (I explore this phenomenon under; From Crisis to Crisis, below here) It almost seems like the foreign security agencies have one better than our own people right here at home, could this have been intelligence information coming from their sources while our own new nothing of it? I suspect, after all given the president’s confident pronunciations against the advisories a few hours before the attack his people must have told him that wasn’t true. Yes Cabinet Secretary Gen. Nkaissery confirmed that the attack caught them by surprise possibly a case of one arm seeing the real danger and sending out warnings while at the same time having serious challenges in kick starting appropriate proactive defenses from the other arms of government. Then again if not our security agencies then who is responsible for this lapse? I don’t want to think that we went down to excessive political interference. One of those significant parts of security that I feel deserves mention here is the implementation of Human Security programs alongside the more military or enforcement type measures. Much of this will involve de-marginalization development work by both central and county governments. These programs must focus on addressing the sensitivities of north eastern residence which make them susceptible to recruitment into groups that employ extreme violence as a means. Simple issues like issuance of national identity cards, building a secure national university campus (now thwarted) and improving relations between government security officers and the local population can turn around people’s perception to the extent that they are not only willing to cooperate with security agencies but they go on to internally developing social barriers against anyone wanting to cooperate with the enemy. In your mind’s eye see a picture of the social (cultural) barriers we have as a nation against homosexuality for example, the same can be natured against terrorism. Kitu Kidigo: High level corruption responsible for among others; north eastern Kenya’s marginalization, nonexistent national security strategy and a neglected police service hopefully is being dealt with in the current purge of the executive and political class. At the same time we need a concerted remedy for the low level crime often touted as responsible for ease of terrorists operations moving in, out and around the country, without such a drive we remain extremely vulnerable. It is not just in the simple taking of a bribe to pass weapons or terrorists; I believe the more significant impact to the national arena will be in changing the focus and time taken by most police officers in chasing illegal gains from other perceived non lethal sources like illegal brewing of alcohol or motorist offences, and center their attention to proactively protecting the nation from this scourge and from other forms of serious crime. The two types of corruption have different enabling dynamics which must be faced strategically if any success is to be had against deeply rooted systems that are widely expected around the country. I will leave this discussion here but suffice it to say that if the government is really interested, guidance for such strategy is locally available, again, if truly desired. ICRC working hard: Is Red Cross being given some government funding? They have become the leading medical responders for these kinds of incidents in the country. If not I suggest an official grant to assist them run their operations or reimburse some of the cost they incur, let the money be put aside now and budgeted in consequent years to promote and help sustain a vital service which Kenyans who are in need get from the agency. Victim management though is still wanting in our ability to quickly trace/positively identify survivors and victim’s and connect them to their families. On this scale this is normally a challenge and if poorly handled it may further cement the enemy’s victory. Looking at the 2014 mysterious disappearance of a Malaysian air plane, poor communication and handling of victim’s families by authorities caused serious perception problems to the government which was among others accused of covering up some aspects. Again we could learn from civil aviation industry actors like Kenya Airways who have handle two major plane crushes both in foreign lands and each time have managed through a preplanned and well coordinated system to handle similar numbers and with the greater challenge of having to do it in multiple countries at the same time. Who won? Al Shabaab did. That is in this round. Witness accounts said the attackers announced they had come to kill and be killed did it happen? Yes, effectively slaughtering 147+ souls including themselves. They even pushed our president to make an illegal directive which over steps the jurisdiction of the courts. This he did by ordering the continuation of a flawed police recruitment process. No wonder the amendments to security laws 2015 allowing him to appoint the IG and deny him security of tenure! Are you still reading but are not convinced? Check your national flag then it is at half mast as a result of this attack, last I knew about it, that is not a celebratory position. If these attacks go on I see us getting to the point where we won’t be able to bear it anymore and will be forced to withdraw our troops from Somalia, then who wins? Of course these criminals will and the minute that happens be sure we will have a major terrorist group like Al Qaeda or ISIS or both as our neighbors and they will come back to haunt us, be sure. Will you let them win this war one cover up of government failure and one secret disjoint of national security strategy at a time? Despite very recent wins against Boko Haram the Nigerian’s didn’t let His Excellency J. Goodluck take them down that bad luck road. About Author: Ben Mouki is a Managing Partner at Winnerman Consult in Kenya.